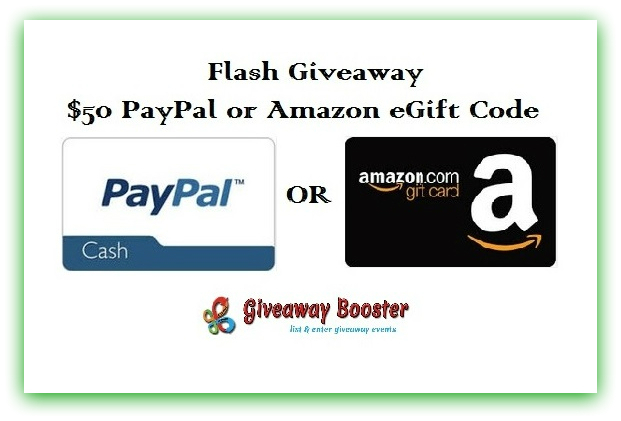 $50 Paypal or Amazon eGift Card Giveaway! For THREE Days ONLY we are offering a fun Flash Giveaway! Gift cards and cash are always a welcome thing. It seems there are an endless stream of items needed for school and home. With the arrival of Fall, I’m sure we are all wanting a few new things for our wardrobe too. If all that isn’t enough, the holidays are just around the corner. So, we are excited to bring you this fun weekend flash for a chance to win some extra Paypal cash or and Amazon Gift Card! Remember, this giveaway ends at 11:59 pm on Oct. 12, 2014! Tell your friends so they can enter, too! « Get my Wish $100 Amazon Gift Card Giveaway! If I win, I’ll choose Amazon and save it for the Lightning Deals as Christmas gifts! Love those. I would choose PayPal, and would love to put it towards our family vacation! That is a tough question. I would get the amazon card most likely. We need more xbox controllers.. I would probably choose Amazon and would buy something for my grandsons, thanks! I’d choose Amazon and would buy Now Liquid Stevia. I can’t buy it locally, so I always order it from Amazon. I would choose the paypal gift card. I would choose Amazon, and I would spend it on Christmas gifts for my family. Lord knows I need all the help I can get! I would choose Amazon! They offer so much, it’d be a great way to do one-stop shopping! I would choose eBay and buy Christmas gifts for my grandchildren! I’d go with Amazon since I have a Prime membership, I can save on shipping. id chose paypal and use it for Christmas gifts for family. Either one would be great to use for Christmas gifts. I would choose PayPal cash and use it towards a Christmas present for my husband. I would choose Paypal cash and use it towards some new much needed post prego clothes. I would choose Paypal because I would like to get a Kindle Fire. By gettimg Paypal I can purchase it anywhere. I would choose Amazon and I would buy a slow cooker. I’d choose the Amazon gift card and buy some books with it. I’d use to spoil my mom for Christmas this year! This will be the first year I can do something really nice for her instead of her doing the most for me. Oh! And I’d choose Paypal! I would chose Paypal and I would treat my husband and I to a date night. Paypal. Use it to pay for my son’s upcoming birthday party. I would pick paypal cash & I would get some stuff for my daughters 2nd birthday! I commented on the JBL Flip 2 over at Jenna Goodwin’s blog. I would pick paypal and use it for Christmas gifts. I would choose the Pay Pal card and use it for Christmas Gifts. I would choose PayPal and would buy some cool stuff at littlezkids shop for my son. I would choose Amazon and I would get a phone case. I’d love to win an Amazon card and give it to my daughter so she buy books. I would choose paypal and use it for gas. I would choose amazon because I did ALL of my christmas shopping last year on Amazon so that is what i would like to do this year! I would love to win amazon and put it in my husband’s laptop fund. Either one, and I would use it for the holidays. I would choose Amazon and would use it for Christmas gifts. Paypal so I could use it to buy Christmas presents! I would choose Amazon gift card and buy some books! I would choose amazon. I would start purchasing stuff for Christmas for my family. I’d choose paypal cash and use it for Christmas shopping! I would choose Amazon because I do a lot of Christmas shopping on Amazon. I would choose Amazon and I would spend it on Christmas gifts for my kids. I would choose Amazon and would use it for Christmas presents. Hmmm….that’s a tough choice. Either way, it’s going for Christmas shopping. I would choose Amazon, and use it for Christmas gifts. I would choose the Amazon. I would order a DVD set of an old TV show that I’ve never seen before, but sounds great, and maybe an movie DVD from my must-see list as well. Thanks! I would choose Amazon and spend it on garden seeds for next spring. I would choose Paypal and use the money for concert tickets for next summer. I would choose amazon! I have a few books and dvds in my wish list! I know my husband has a couple of games too! I would choose Amazon and use it to get some movies the whole family could watch. I think I would choose Paypal, and buy Christmas gifts with it. I would choose PayPal, and I’d use it for groceries. Tough choice! Probably paypal & I would buy some make up off etsy! Tks! I would pick Paypal and then transfer it to my bank and the family would go to the movies. i think i would choose paypal because then i can use anywhere , pretty much. PayPal – I don’t know what exactly I’d use it for, probably Christmas gifts. I would like the paypal and I would use to buy knitting and crocheting patterns to make some Christmas gifts. I would choose Amazon and might buy books. I would choose Amazon and start buying toys for Christmas. Amazon gift card – YARN!! I would choose paypal, and use the money to buy groceries, Thank you! I would choose Paypal cash. I am saving for a vacation. I would choose the Amazon card and use it on wedding supplies. I prefer paypal so I could get Christmas gifts. I would choose Amazon and would use it while Christmas shopping this year. I’d buy more toys for my grandsons.